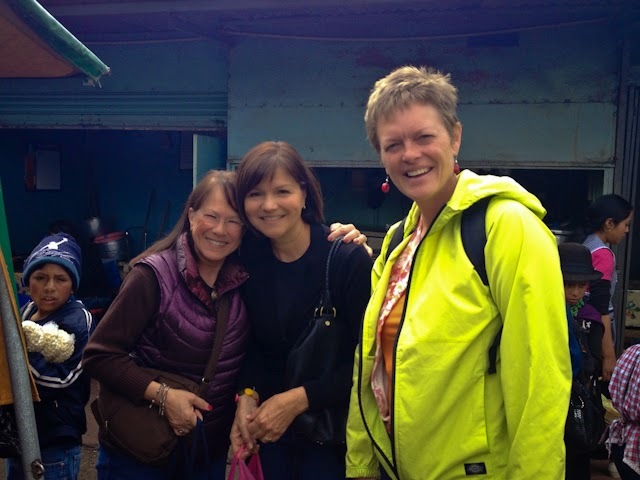 MARKETS IN CUENCA ECUADOR - Shopping in Cuenca - Fabulous Friday with Fun Friends! 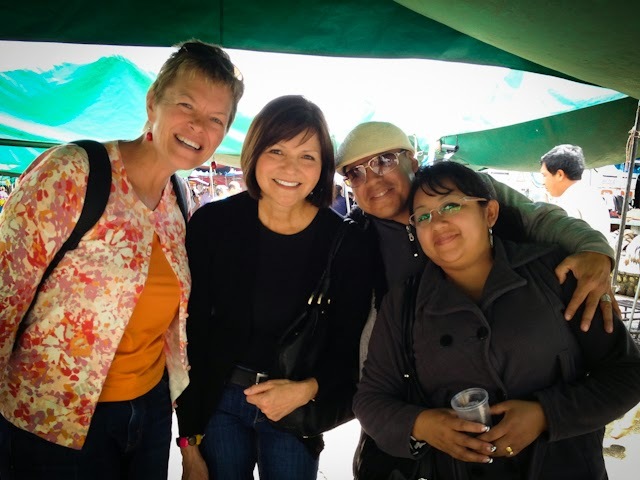 Karlita, Teresita, and our driver Freddy and our shopping bargainer Maritza - We shared a fun "Market Day" together, and more! Bo and I live one block away from the 10 De Augusto Mercado. So, naturally, this is where we do most of our shopping. 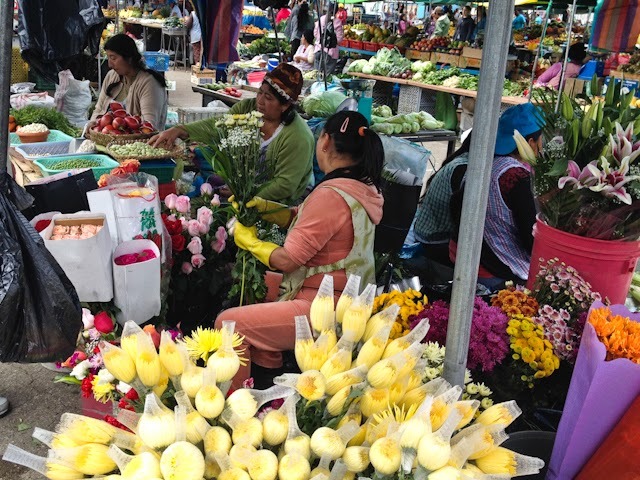 Not only do we have the Mercado with all of it's amazing fresh produce, meats, and fish - but we also have a plethora of tienditas within a two block radius that meets all of our daily shopping needs. We've become very spoiled with our city-living location. It's not for many because there is a different energy living in the city. Below our third floor flat we hear lots of traffic and buses whizzing by, vendors shouting, children laughing or crying, pedestrians chatting as they scurry along, and the occasional alarms going off and impatient drivers honking away. It's become music to my ears - en serio! Either I've gotten used to it, or it really isn't that offensive to us because we continue to enjoy living here. For us, it's a welcome change from living in the country for so many years. 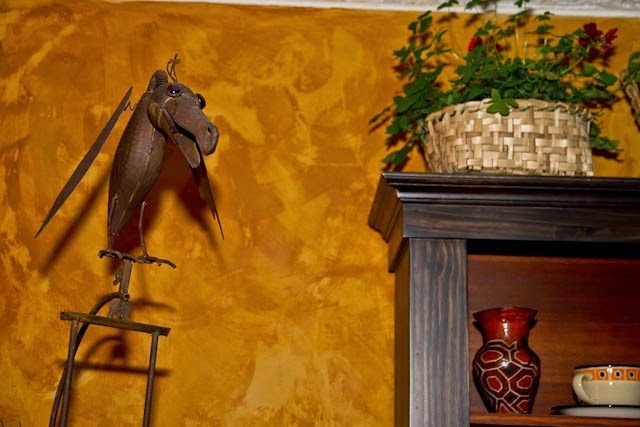 When we first landed in Cuenca, we were advised to temporarily rent in the Historic District so we could walk out our door and be close to EVERYTHING. 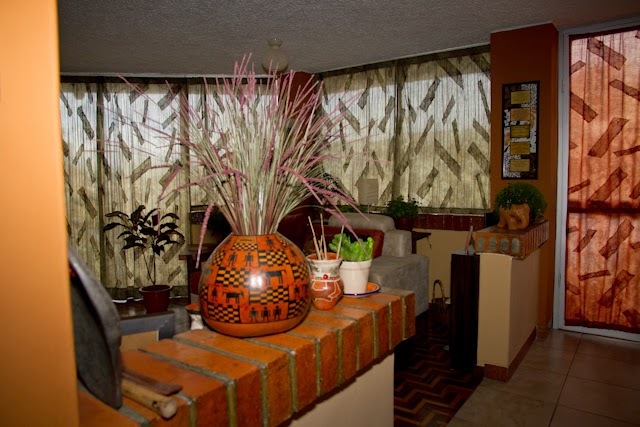 For us it was the best decision because we quickly became familiar with El Centro, and it was so convenient to be in the heart of the action. We never left this area. As a matter of fact, in our "5 moves during the first 4 months" we continued to rent within a few blocks from our first location. Our current place is only 1 block from our first rental - go figure! So, here we are still in the same location 20 months later, and the 10 de Augusto Mercado is our familiar and favorite market. 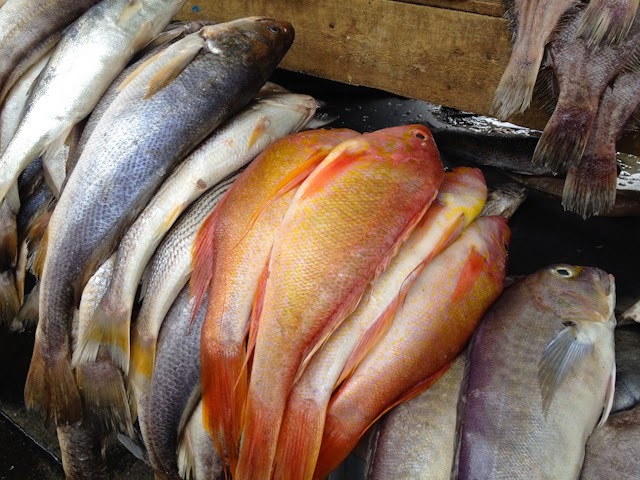 We've heard lots of different OPINIONS about the different markets in our area, from "This one is dirty, that one is clean" to "I shop at SuperMaxi because I'm afraid to eat from that market" - and on and on. We LOVE our market. 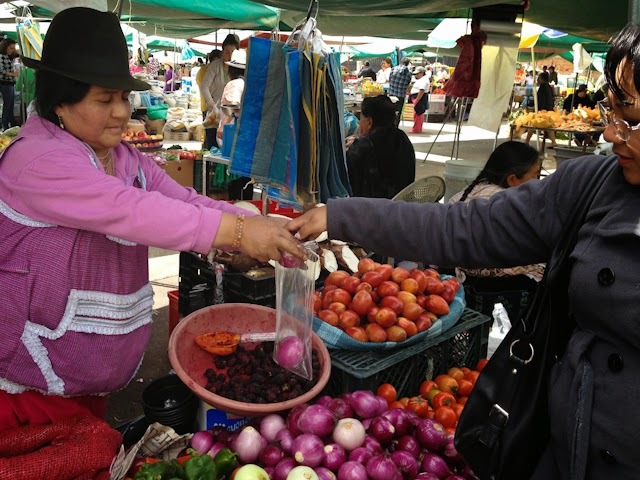 The vendors know us, they treat us with kindness and charge us fairly, and we've become very familiar with our tienditas too. 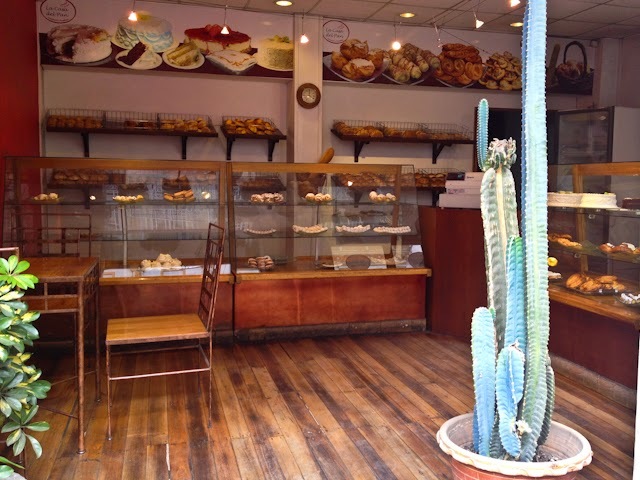 We know where to find our assortments of nuts and herb and spices, real butter, free range organic eggs, pure olive oil, fresh basil, and on and on. It's all here, just 1 to 2 blocks away. Cuenca has MANY mercados. Some we have not even visited because of the convenience of always going one block away and then hauling our goods one block back to our flat. 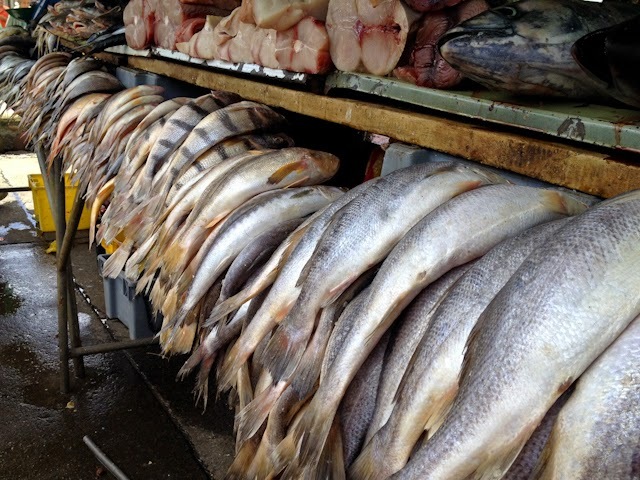 Yet, there are so many markets to visit and explore and get to know. 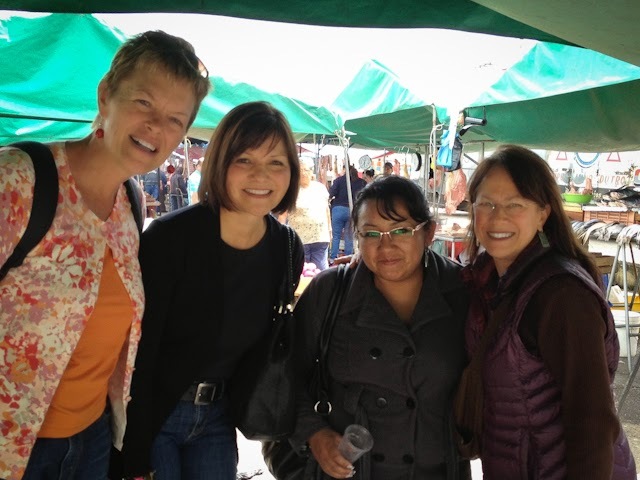 That's why I was so excited when my ñaña invited me and our other ñaña to join her for a Friday "Ñaña Market Morning." Oh, ñaña is an Ecuadorian word for sister. We've become such good friends that we are now ñañas, and every Friday we have a ÑAÑA DAY. Sometimes we go to Baños together to soak all day. Sometimes we go shopping in the city and have lunch. This day was going to be our Market Day. And what a fun day it was. Not only did we have a fabulous time exploring two different markets, but we also went out to an elegant lunch in El Centro and then ended it with a most delicious treat. So, let me share our memorable day with you so you can enjoy more of this fabulous city we live in. First stop was FERIA LIBRE Mercado. 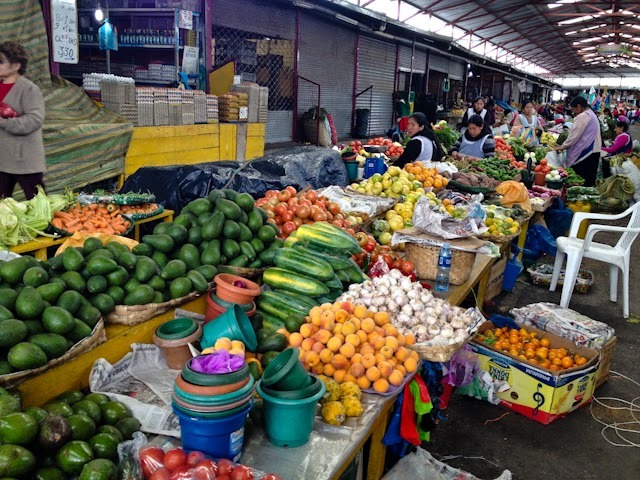 This is Cuenca's largest market and goes on and on for several blocks. It is not for the faint-hearted because one can get on sensory-overload. Not only do they have produce and food here, but you can find clothes, electronics, and more. Farmers come to sell their goods to other vendors, who in turn sell them on the streets or at their other market locations. Me and my ñañas - ready to storm the gates of Feria Libre! This vendor is up to her neck in Platanos. Platanos (Plantains) are one of my favorite fruit-vegetable. 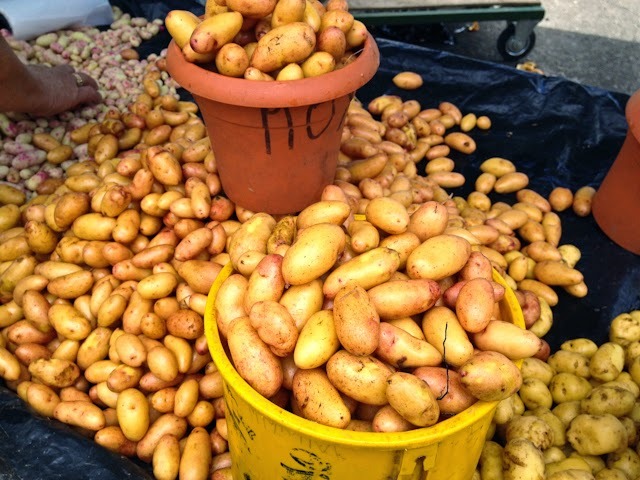 Yes, They are a fruit, but cooked and eaten as a starch vegetable side dish. 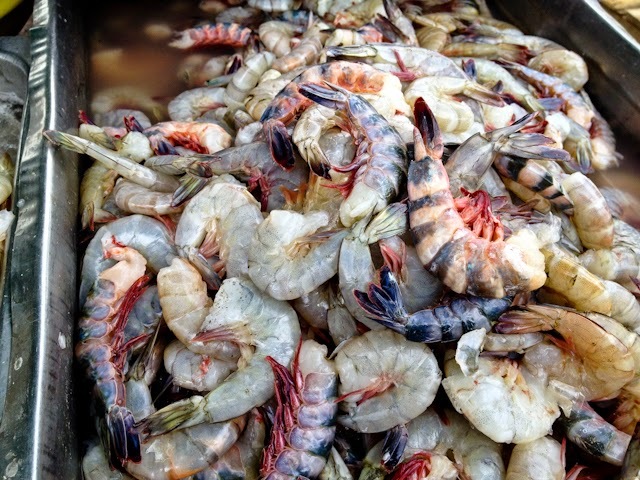 I slice them and fry them in coconut oil - yummmmm! 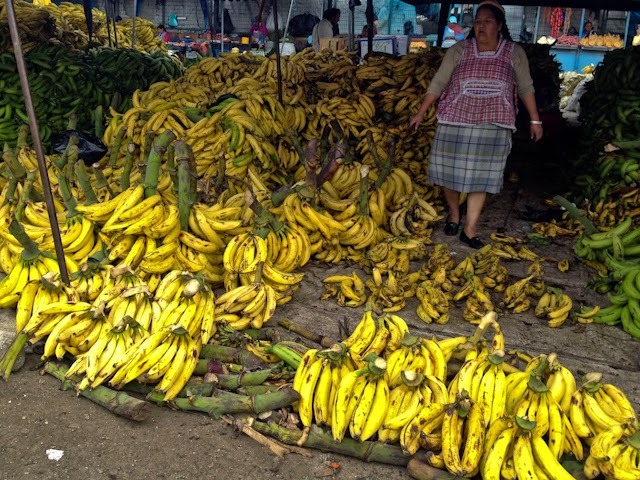 We're never lacking for ripe Platanos here in Ecuador. Bo buys them 7-8 for a dollar at our Mercado. I didn't price them here, but I'm sure you can get a few more for that price. 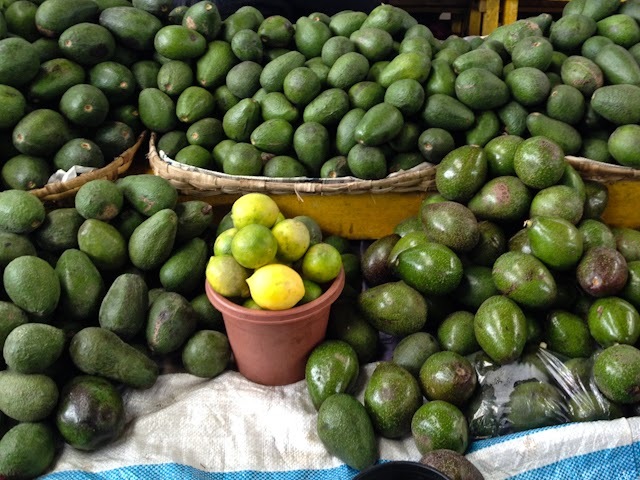 One could shop here daily and not lack for anything on their produce-shopping list! Ginger is abundant here. 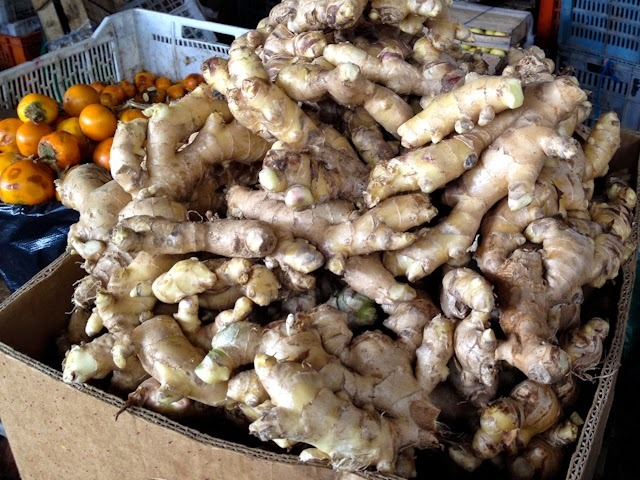 We cook with Ginger often, and I love to slice some and steep it in my tea. A huge chunk costs $1.00. Every variety of potato was available. Our grand find was SWEET POTATOES. I didn't get a photo - I was too excited - it was the first time I found sweet potatoes in our 20 months here. I'm still enjoying them because I bought A LOT!!! 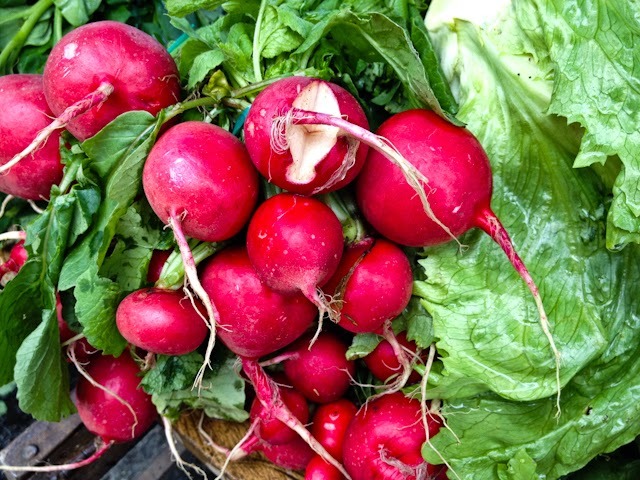 Radishes were huge! I also found LEAF LETTUCE today. You can find Iceberg Lettuce daily at the markets, but leaf lettuce are not that common. I have a vendor at the 10 de Augusto who has leaf lettuce once a week. Yes, SuperMaxi always has them, but I don't go there often. 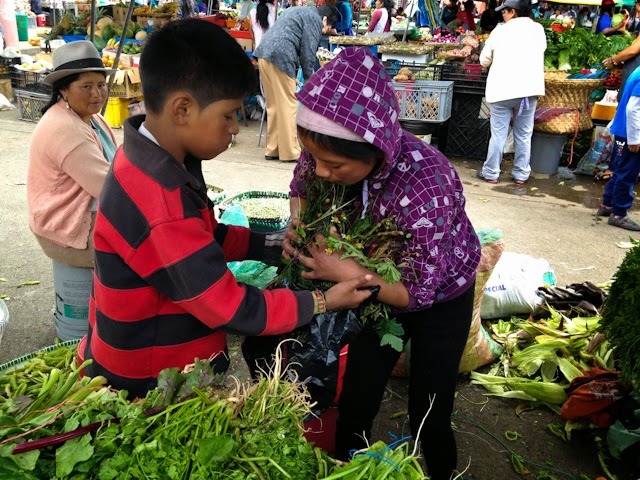 We finished our shopping spree at FERIA LIBRE and Freddy loaded up our produce and drove us on to the Totoracocha Mercado which is only open on Fridays. 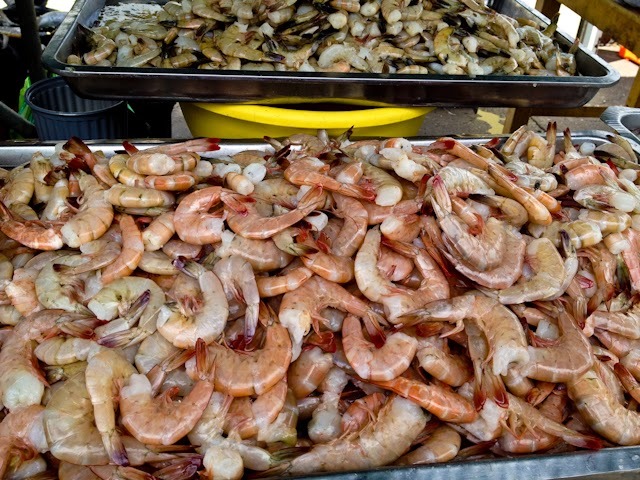 Here they bring in FRESH seafood from the coast (which is about 4 hours away). 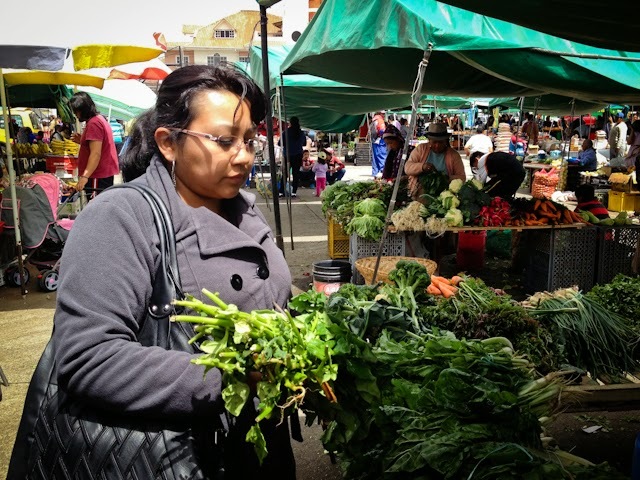 Maritza helped Karlita pick the best spinach and get the best price. 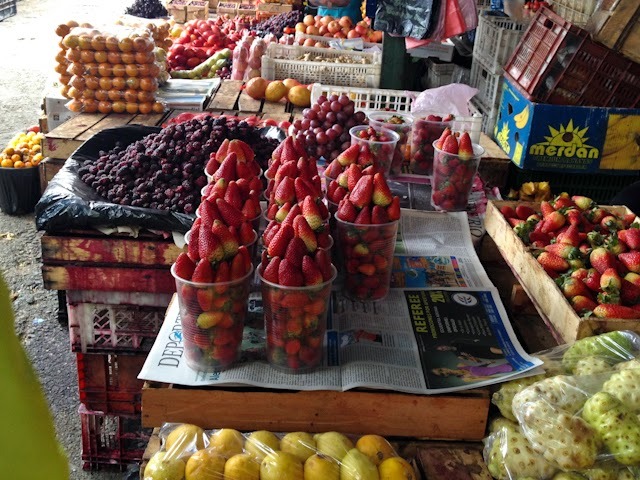 The flower market area was thriving with colorful fresh varieties. Children work and help their parents. These two were packaging the Horchata wreath that Teresita bought to make tea with. This is different from Mexican Horchata which is a rice drink. 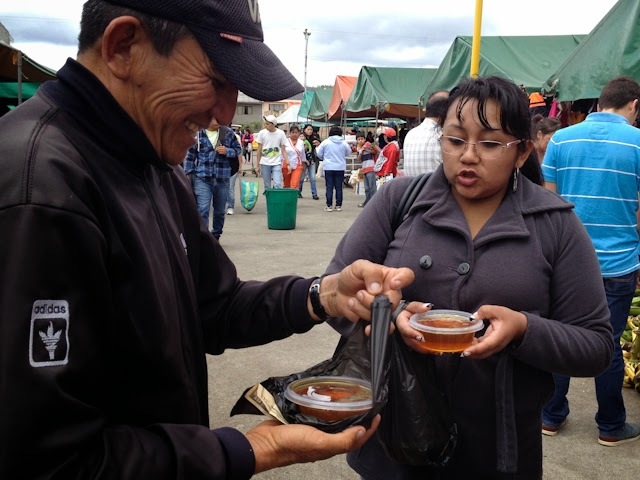 In Ecuador, Horchata is an herbal tea drink made from a mix of herbs and flowers and is a typical drink from the province of Loja. 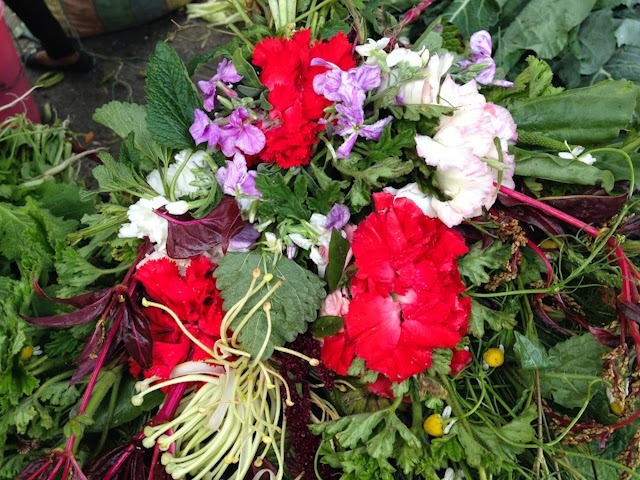 A Colorful HORCHATA Herb and Flower WREATH - sold for $1.00. 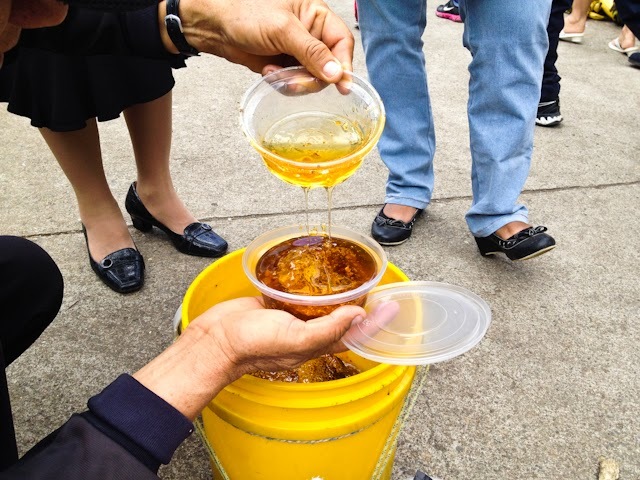 This joyful man was selling the honey, honeycomb, and pollen. I sampled it and what an incredible flavor. He is only there once a month, but he gave us his phone # so we can contact him. The three ñañas bought a bag of the pollen and split it three ways. 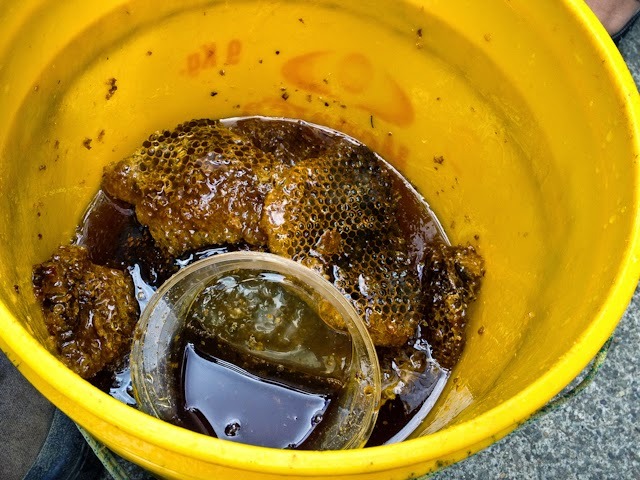 Of course, each of us went home with a container of this golden rich honey. So organically pure and sweet - NO SUGAR ADDED like lots of honey they sell here. 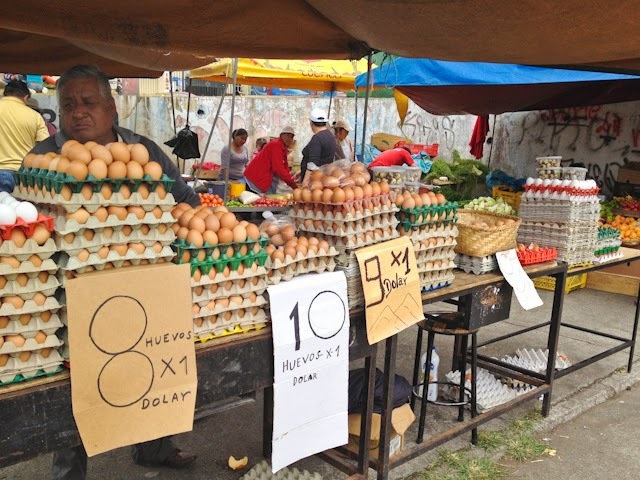 Eggs were abundant and ranged eight to ten for $1.00. Bo and I buy free-range eggs near our apartment - we pay more, but they are so much healthier and incredibly delicious. 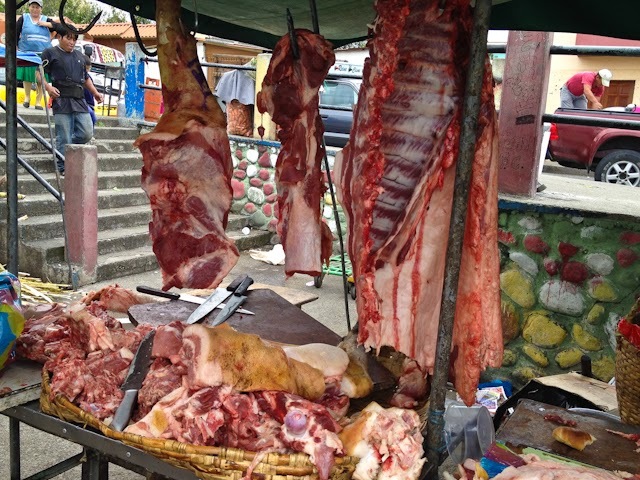 Yes, the meats hang fresh and unrefrigerated at the markets. Yes, Bo and I buy our meat at the open markets and we're still alive and well. What fun we had shopping and spending the morning with Freddy and Mariska. 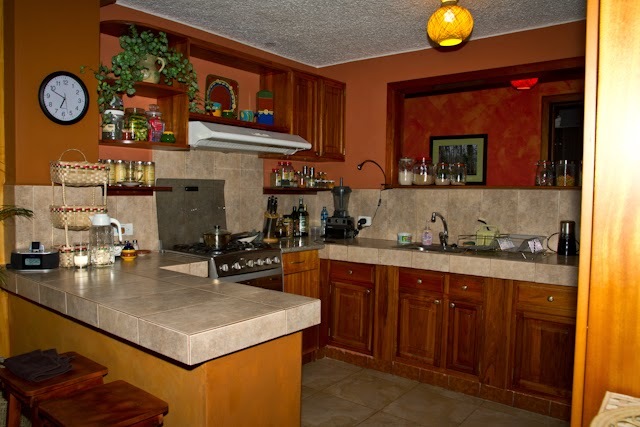 They were both a wealth of information and made our shopping trip to two markets and then three trips to unload our bags at each of our casitas a delight. We bid farewell to our Freddy and Mariska and then headed to a new restaurant Teresita picked in El Centro - "La Brasserie" - for a classy elegant and relaxing lunch. 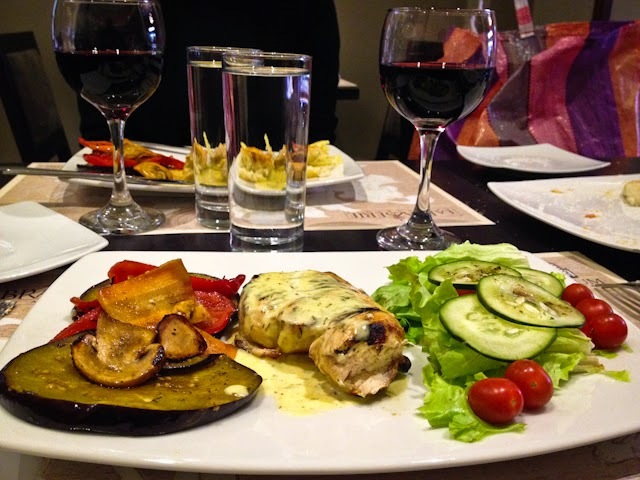 My Chicken in Bearnaise Sauce and Roasted Vegetables and Salad was to die for! How I savored it with my glass of Cabernet. I didn't get a photo of Teresita's pick - Pollo Coq au Vin, roasted vegetables and Potatoes Au Gratin - but it was also a thumbs up! Karlita's Creamy Champiñón Soup and Asparagus Salad was a third hit! Check out that creamy dollop in her soup. Not sure what it was made of, but was it ever delightful. 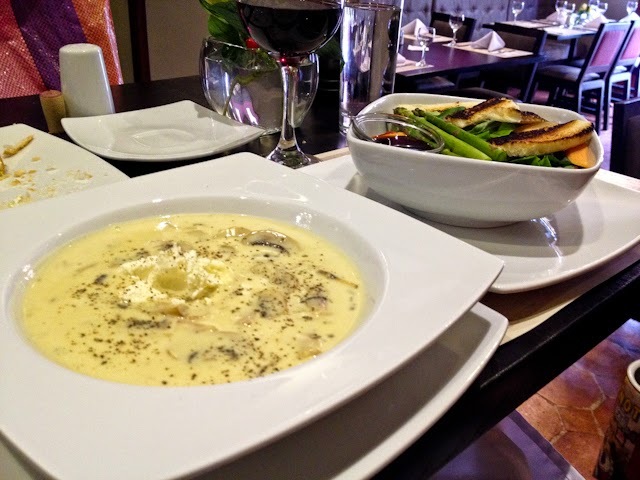 They also serve a Creamy Pumpkin Soup - which I plan to try next visit. After our long dreamy lunch, we stopped at a Panaderia and Teresita bought a cinnabon-type pan to have with her morning cafecito. Then we headed for our after-lunch treat. 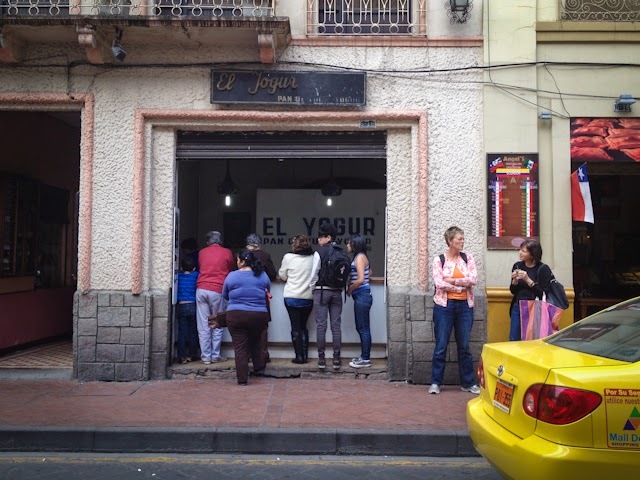 A stop at El Yogur for a Mora Yogur con Pan de Yucca. Oh, too delicious for words. As you can see, this is a popular spot. This was Teresita's find for us. Karlita's turn. A stop at her favorite yogurt shop where we each bought a 16 oz container of thick creamy Greek Yogurt for $5. It was so amazingly delicious, that Bo and I returned two days later for more! 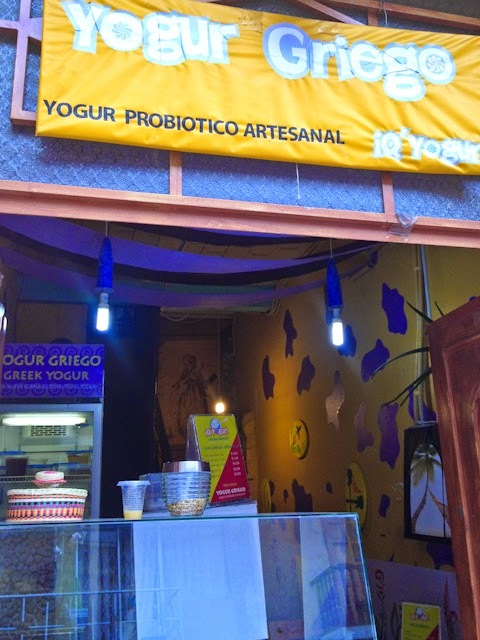 Bo and I ordered yogurt drinks with Pan de Yucca here, and we sat and visited with the owner, Vicente. He makes the yogurt himself from scratch, minimal processing, all natural, and it's going to be where we get our Greek Yogurt from now on. I love when others share their favorite places with us. La Linda's turn. The Liquor Store! My favorite place to buy wine - and where they have a great selection and for much less than Bo and I have found anywhere else. We had a most delicious Cabernet (Santa Helena) at lunchtime, so I wanted to see if they sold this wine here - and they did! It was only $9.50 for a bottle - woohoo. I thought it was going to be a lot more. I bought it to save for Bo's and my anniversary in September. TO ANOTHER FABULOUS ÑAÑA FRIDAY TOGETHER! Thank you, Mariska (isn't she adorable? ), for sharing your shopping expertise with us and for bargaining for us. Mariska's mother is at Feria Libre on Wednesdays and she makes and sells humitas and other delicious foods. Mariska is there helping her mom on that day. We hope to visit her there to try her mom's cooking. Thank you my ñañas, for another memorable Friday together. Thank you, Freddy, for being our personal driver and for helping us with all our bags. You're the man! Hey, do you readers know Freddy Remache? If you don't, you should. 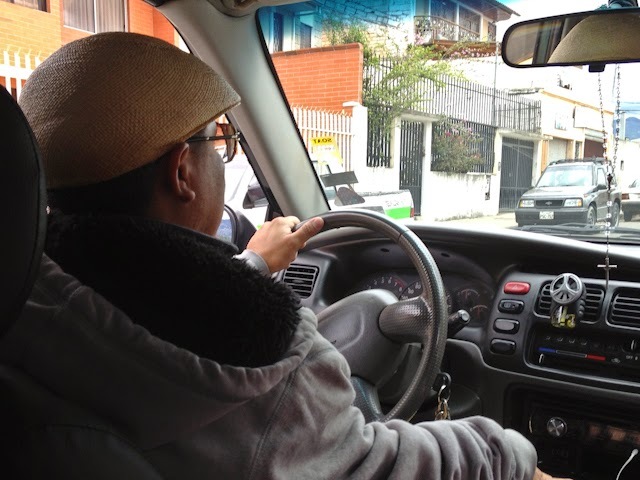 He is punctual, speaks English, and is a safe driver and fun to know. Freddy picked Bo and me up from the GYE Airport this last trip back from the USA. Our flight was over 3 hours delayed (torture trip). When we got to the terminal with all our luggage, Freddy was there waiting for us at midnight, and he drove us safely home through the Cajas to our Cuenca apartment. Kudos to Freddy! I recommend him to anyone needing a driver. 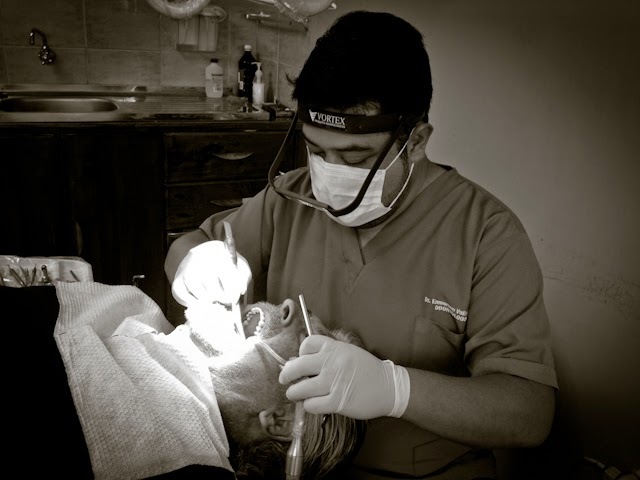 DENTAL CARE IN ECUADOR - Our Cuenca Dentist experience! Yes, we've been to the dentist here in Cuenca! Good experience or bad experience? Great experience! So, how does one know who to go to for medical or dental care - and if they're reputable, and if they're going to do an excellent job and if they are honest and all about their patient's care? Bo and I ask our Ecuadorian friends for recommendations. 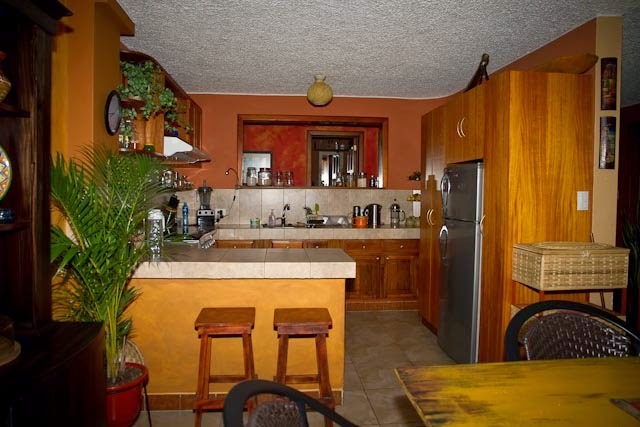 One Ecuadorian family who are well-connected here in Cuenca and who are like our family here are a fabulous source of information for us. We found our family doctor and dentist because of their recommendations. We trust this family and who they know. That makes it very easy for us because we know they will only refer us to the best. It was time for our cleanings. We always went every 6 months back in the states when we had dental insurance through Bo's employment. Without insurance, a cleaning and mandatory x-rays would cost each of us close to $200 a visit. A friend back in Portland, Oregon told me that she recently paid $300 for her cleaning and x-rays - and she is NOT insured. CRAZY! So, when we made our appointments with Dr. Emerson in El Centro, we were happy to learn that our cleanings would cost us $30 each. Who does the cleaning? The dentist, of course. Bo went first. I watched. Nothing fancy about Dr. Emerson's office. It actually had a lot of that old-fashioned outdated dental equipment. We had to spit into the bowl, and there weren't fancy TV's or sound systems going on in the office. It was quiet, and Dr. Emerson talked to us and patiently worked on Bo's teeth while I asked him lots of questions about his practice and his education. He was open and happy to share with us. Dr. Emerson does it all - from making the appointments to cleaning his patient's teeth. Then came the news. Bo needed a filling. He could do it right there at this same appointment, and it would cost $20. En Serio! My question, "Do you give novocaine?" He said no, it wasn't necessary. But, if Bo wanted the novocaine, he would be happy to give it to him. Only an extra $5. Dr. Emerson reiterated it would not hurt, he would drill slowly, and if Bo decided he wanted the novocaine during the drilling, he would stop and inject him. He said it wasn't necessary in several different ways. Was Bo convinced? Was that sweat I saw forming on Bo's brow?? Novacaine or no novacaine - that was the question? What was his answer? So Bo decided to trust Dr. Emerson and go for it - no local anesthetic. Drill away........Yikes! I stood close by and watched Dr. Emerson gently and slowly drill out the decay while Bo finally relaxed and trusted that it would not hurt. And, apparently it didn't. Bo said only at one point he felt a slight twinge of pain, but all in all, it was painless and went surprisingly well. Dr. Emerson filled the cleaned out area, and in less than 15 minutes, Bo was out of the chair with a sparkling smile and a new composite porcelain filling. So, we saved $5 because of the "no novocaine" decision - and we left Dr. Emerson's office after paying $80 for two cleanings and one filling. 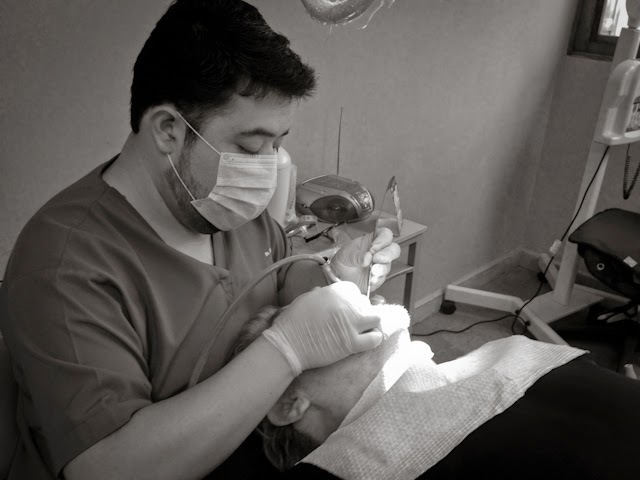 What's not to love about dental care in Cuenca?? There are many dentists who are well-trained and brilliant in Ecuador - and they have all the up-dated technology and resources, as well as speaking English. Dr. Emerson's office was not fancy, and it had more of an older equipped appearance, but he knew what he was doing and he did it carefully and with expertise. Bo and I don't need fancy. What we do need it excellent care and from someone we trust. We trusted Dr. Emerson 100%. 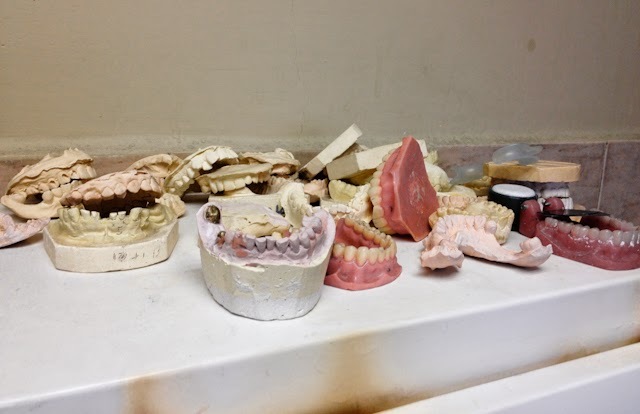 For the plates and dentures, it includes all office visits, fittings, lab work and impressions. USA Dentists are denying services to patients who do not want routine x-rays taken - which are now required by the American Dental Association. In Ecuador, dentists allow patients their right to determine their own care and treatment, so they don't take set after set of x-rays on their patients. Many come from the USA just to have their dental-doctor vacation because it costs 80-90% less to have dental work in Ecuador. 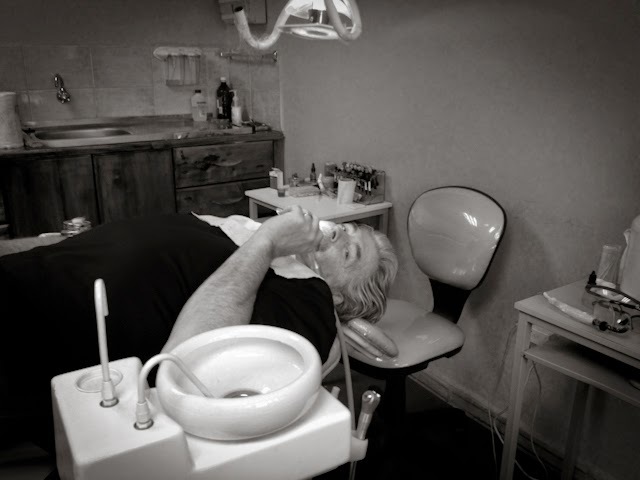 I spoke to a vacationing ex-pat who had extensive dental work done while she and her husband were here for a 6 week vacation - and she said not one time was novocaine used, and she sailed through several appointments painlessly. 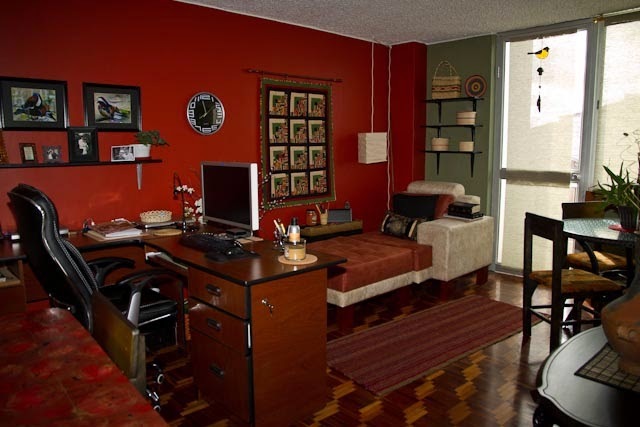 The work she had done here would have cost her thousands of dollars back home, and she was able to have her Cuenca Ecuador vacation between her appointments. So, go ahead and make your dentist appointment - and when you are told "no novocaine" - don't be scared!!! HEALTH CARE IN ECUADOR - IESS HEALTH INSURANCE - Our first IESS Doctor Appointment!! 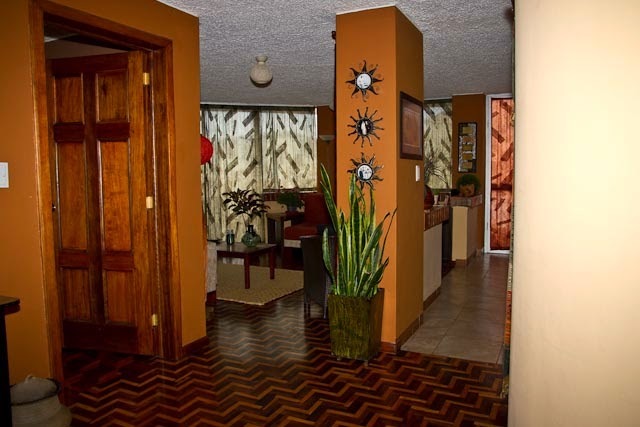 When we first moved to Cuenca, Bo and I decided to be "self insured" for our medical needs. We figured if we kept the money we would have to pay for monthly health premiums in our own account, we would come out ahead - due to the low cost of medical care here. Most insurances we had inquired about wanted at least $100 a month per person (way less expensive than the high premiums in the USA) and the coverage wasn't that great - plus the paper work and hassle to get reimbursed was not a smooth process. We decided that $2,400 in the bank per year would cover more than enough of our yearly medical bills. But, what if we had an emergency? A BIG emergency??? Sometimes we sail through our life by faith. We have been back to the USA three times without any medical coverage. Yes, it's risky - but, we've been okay so far. As for medical coverage in Cuenca, that's different. To spend a day or several days in the hospital is low enough for us to pay out-of-pocket if we had to. Yes, it would be a big chunk of money, but we could do it. Then I heard about the IESS Government insurance. For a few months it was blocked from ex-pats being able to apply for it, and we missed that window of opportunity. Around March of this year it became available again for ex-pats, and I jumped on it and got Bo signed up with me as his dependent. However, the rules were changed. Now, there was a three month wait for coverage from the time we were entered into the computer. Bo's monthly payment would be $70.04 and mine would be $11.59, for a total monthly medical premium of $81.63. For the first three months, the payments were for Bo's coverage only. My payments then began in August. We are now both covered 100% for all of our medical needs: Doctor appointments, lab work, x-rays, ultrasounds, prescriptions, eye, and dental (the DENTAL covers us when we turn 65). So how does it work? 1 - Once your 3-month waiting period is met - you call the IESS phone # (07-413-4555) and ask for your first GP doctor appointment. I told them I wanted a doctor in El Centro, so they scheduled Bo at the IESS Consultorio building near Parque Calderon (we love walking to everything - even our doctor appointments!!!). On Friday, we met with Dr. Marco at 7:15 am. He was kind, attentive, and thorough. Of course, going to a doctor appointment here is so painless. No waiting, no paperwork to fill out. The doc does all of that in front of you on his computer - and it's minimal and to the point, "How can I serve you, and why are you here today?" No privacy act rules, no secretary or nurses or other patients waiting in adjacent rooms! He does it ALL and you're it for the entire appointment. He asked Bo why he was there, we told him all Bo's concerns, he ordered labs, an ultrasound, and scheduled Bo for his specialist appointments and physical therapy. He checked Bo out for a couple of GP issues, gave us our future appointment instructions, shook our hand, and we were out the door. No papers to sign, no money to pay - just a friendly "Gracias." 2 - We were given a slip of paper with three different numbers. We went to the pharmacy line, gave them the paper, and they gave us Bo's prescription. Free! We then went to the lab area, gave them the paper with the other two numbers, and they entered two appointments into the computer for Bo's lab work and Ultrasound. 3 - Today we walked back over to the lab (same building as our doctor). We stood in line for about 5 minutes, Bo's turn came and they sat him down and drew his blood - free. His results will be back on Thursday, and he has a follow-up appointment on Monday with Dr. Marco to review his labs. He is also scheduled next week at the IESS Hospital for physical therapy and in September he will go see a specialist at the IESS hospital. 4 - The next appointments we will make will be for eye care and to have Bo's hearing checked. The procedure is the same. The General Practitioner doctor will schedule these appointments during Bo's Monday visit. 5 - The appointments are important to keep. If one has a medical emergency during the waiting period, you can go to any hospital and supposedly IESS will cover your medical care there. I have heard conflicting stories about this - so I need to verify this information. 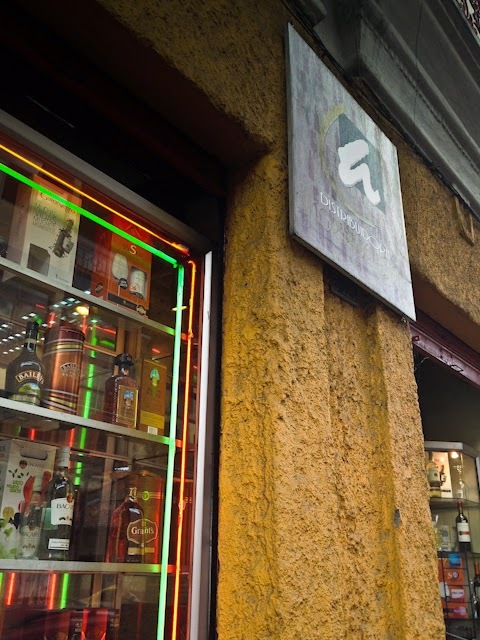 Sometimes the pharmacy does not have the prescription required, so one has to go to another pharmacy (plenty of those in Cuenca) and pay for the prescription. Because medication is so inexpensive here, no problem!! 6 - Are the doctors as good as the ones practicing outside of the IESS Government Insurance? Absolutely. Our family doctor in Cuenca, Dra. Rosita, told us that she would be an IESS doctor but because she doesn't have handicap ramp access to her office (you have to climb stairs - yes!) - she was not approved. I think some doctors like that monthly fixed income paid to them by the Government. We will still see Dra. Rosita if we need her medical expertise. She is brilliant, kind, and charges $10 per visit with free follow-ups. We love her! For now, we are establishing our medical care with IESS so we are in their computer system. Then if and when an emergency occurs, we will have that 100 percent coverage. Yes, for less than $1,000 a year medical insurance premiums and 100% medical coverage, it's worth it for us to go through the system. Nothing fancy here when it comes to hospital care. You don't get a private room, you provide your own personal care items for your hospital stay, and you're not pampered and charged for every little thing like back in the USA. The important thing is the quality of care - and we have heard only wonderful things about the care and treatment others we know have received from the IESS doctors. Is it like the USA? Of course not! Don't come expecting a USA doctor-hospital experience. But, do expect to receive quality medical care from excellent physicians. If you are a legal resident of Ecuador and have a Cedula, you are qualified to apply for IESS Insurance. Application for voluntary enrollment can be made at the Social Security office in Cuenca on Gran Columbia (Instituto Ecuatoriano de Seguridad, or IESS). You can also sign up on line at www.iess.gob.ec. We embrace the medical benefits and care we continue to receive here and we are thankful for a country that offers us, as ex-pats, the opportunity to be a part of their Government health care benefits. 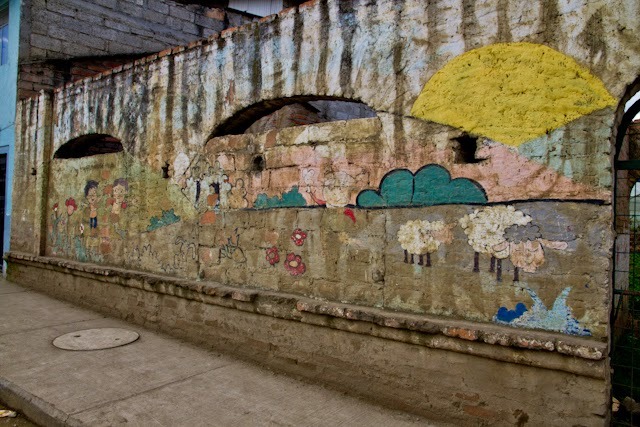 Another reason we love living in Cuenca!! So, we decided to make the BIG DECISION to return to our Oregon home and BURN THE BRIDGE! By that, I mean - we still had our home and enough of our STUFF to go back to if things didn't work out as we expected it to here. When we originally landed in Cuenca on December 5th, 2012, it was with the intention of staying - of course. But unlike most who decide to ex-pat, we did not do any exploratory visits, had never been to Ecuador, and we moved here with 6 suitcases and 2 carry-ons. Yes, we did sell LOTS of our STUFF before we left on our ex-pat adventure. However, because of timing and also the thought, "What if we don't like it?" 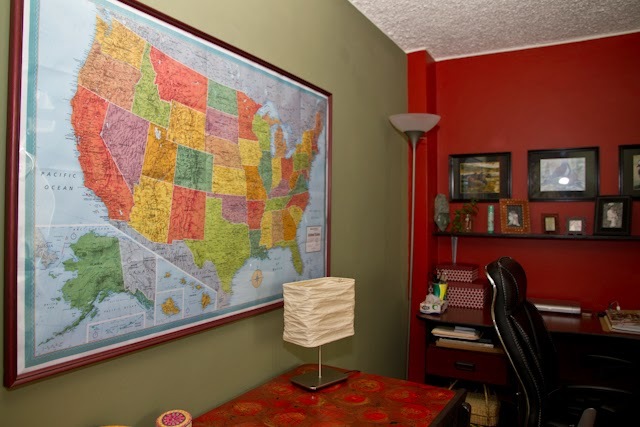 - we ended up renting our home and then storing in our property sheds the remainder of a household of 40 years of treasures that we weren't ready to let go of. Here we are 20 months later and comfortably settled into a South American culture and lifestyle, and our simplified way of living - loving our retirement and freedom. Of course this CHANGE didn't happen without frustrating challenges (Bo calls them "opportunities to grow"), moments of panic attacks, melt-downs, and questioning ourselves in the beginning, "What in the world have we done?" Yet, because of the amazing people we immediately began to meet and the loving Ecuadorian people who continued to embraced us and welcome us into their lives and families, Cuenca grew on us and challenges became victories as we began to feel more and more like this was HOME. Why did we come? Our main reason was to find a new location out of the Oregon Willamette Valley 8 months of rain. Summers were beyond beautiful and the weather was perfect, but 8 months of overcast, damp, LONG winters was a continual yearly struggle for Bo. In the end, it became a struggle for me too. Our second reason was to retire early and enjoy our 60's free to travel and enjoy life together NOW while we still have our health. Our third reason? The changing political and economic atmosphere of the USA inspired our decision in a big way to ex-pat. Oh, there's lots of other reasons why we made such a change in our lives, and we are still learning how to adjust to a completely different culture and lifestyle - but we are back in Cuenca, happy to be home, and ready to continue our ex-pat adventure. After our recent return to Cuenca from the USA - and weeks of selling and giving it all away - we admit that if we knew it was going to be such a difficult, heart-wrenching, letting-go-of-everything task, we may have never done this. Garage-selling our beautiful household treasures for practically nothing was a hard one for me. Bo sold a 25-year accumulation of his shop tool treasures, and the first day he struggled big time. By the second day, he was blessing people and ready to sell and give it all away. When we were ready to let go it became easier and easier, but the work part of it was exhausting and draining. Our weeks in Oregon were not a vacation. It was a time of purging and selling and letting go from morning until late evenings. I could not see a light at the end of the tunnel. A few generous friends blessed us with their precious time and helping hands, making this exhausting task a bit easier (Thank you dear ones - you know who you are!!). Emotionally, it didn't end for me until the day when I was able to walk away from our empty cleaned out property and head for the airport. So, IT IS DONE! Bo and I are back in Cuenca and we both feel like we are on vacation. 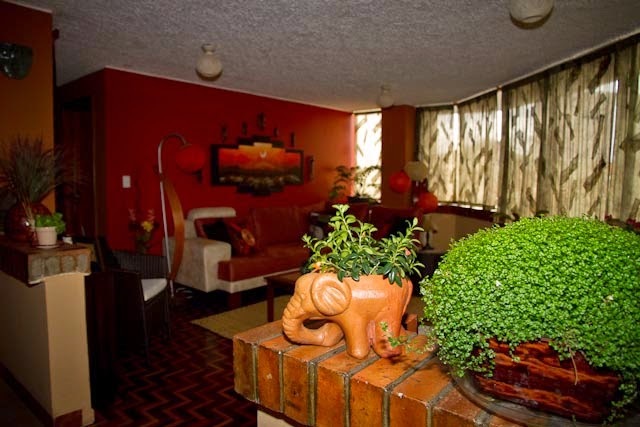 I have an even greater appreciation for our simple lifestyle here, for our small but lovely apartment that is truly home, and for the many friends that have embraced us since our return. This few weeks' journey has inspired me to reflect on the last year and a half of living in another country and my reasons for wanting to go "BURN THE BRIDGE" and return back to Cuenca to call this HOME. 1 - COST OF LIVING - Isn't this THE BIG ONE for so many who have left the USA? We noticed it even more this last visit - hearing that the cost of everything has gone up. Well, we were in "reverse" culture shock after living in a country that allows us to live such an inexpensive affordable lifestyle. The COST of groceries and eating out (which we did a lot of because of the hours of work and exhaustion) put us both over the edge. We finally had to accept that this is the USA not Cuenca when it comes to the cost of anything. Homeowners and auto insurance, and gas and auto expenses were also things we dealt with there that we do not have, need, or want here. Yes, maybe we will have an auto down the pike - but for now, walking, buses, and taxis suit us fine. One day, while in Florida, my girlfriend and I were in a shopping mall. There were two stores we needed to go to a few stores apart. I wanted to walk to the next store, she wanted to drive there. I said, "It's right there!" She replied, "Yeah, they look close, but it's a mirage. Besides, driving saves time." Here in Cuenca we have TIME, and we walk miles and miles and love it. Bo said that the most walking he did in the States was walking from the door to the car. I agree! 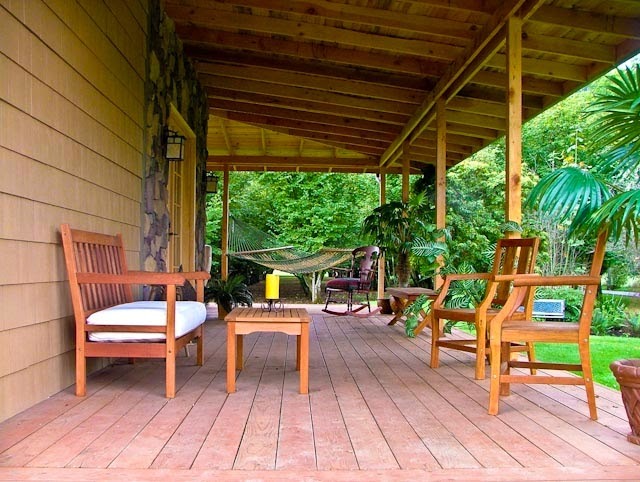 2 - HOME IN THE COUNTRY vs CITY LIVING - I must say that being back at our beautiful Oregon home had it's allure. I loved hot-tubing every evening after a long day of purging and selling, and I loved the summer country smells and quiet country life. I loved being surrounded by trees and having no traffic zooming by (we lived in a very isolated area). Yet, I looked at all that work - yard work, big house to keep clean, old house to keep updated constantly, and imagined STUFF once again pouring out of every room and shop and shed. 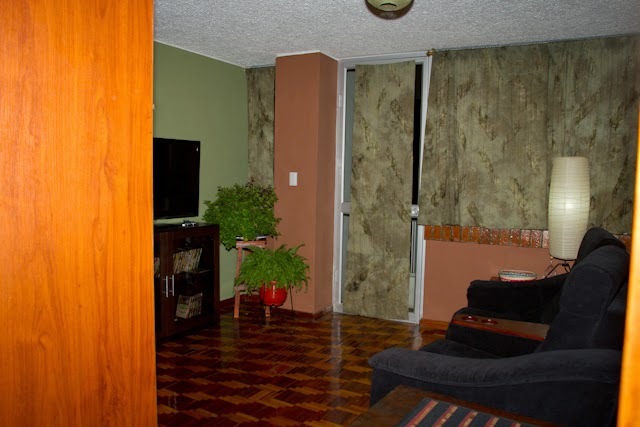 Then, I thought about our Cuenca apartment in the city, so cozy and comfy and beautifully furnished with EVERYTHING we need, near our market, pharmacy, and every other store we need something from, including walking distance to the Tomebamba River, Parque Calderon, Parque De La Madre, and so many other fabulous beautiful sites. Knowing that this season of our lives is for living in the city and not the country made me want to leave it all behind and return to our Cuenca city life! 3 - FAMILY AND FRIENDSHIPS - It was such a non-stop working time for me in Oregon that I was only able to spend time with friends that came by the house to see us and/or help us. I didn't realize how much time and how difficult a task this would be for me - my emotions and energy were low during this working trip. I'm grateful for the friends I did get to see, but sad I didn't get to say goodbye to others. I am thankful for the friendships we now have in Cuenca, and I realize how much time we are able to spend here with the people we love. Retirement life isn't as busy and all-consuming where we are constantly working and unable to spend time with the people we enjoy. Being retired ex-pats is a good thing for us. 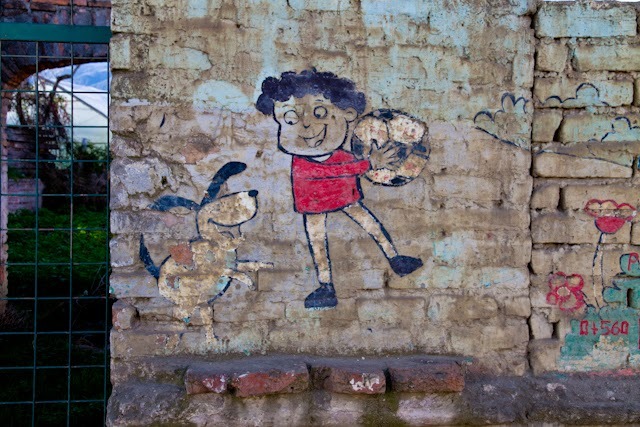 More time to play and be with our friends - and we have some quality and wonderful friends here. For this I am so thankful to my God. 5 - MEDICAL - While we were back at our house, Bo was spraying a mold remover solution on his shop ceiling, and he got some in his eye. It required a visit to a 24-hour care clinic where they flushed his eye out and gave him a prescription for antibiotics (which he never filled - who could afford it??). There went $160 of our meager garage sale money. We are so grateful for the excellent and inexpensive medical care we have and continue to receive here in Cuenca. It's a big question for many planning on moving here, and we have both personally experienced nothing but the best of medical care here. We now have the IESS government insurance for $80 a month - and we are covered for all of our medical, dental, eye, and pharmacy expenses. We've heard about the pros and cons of this coverage, and some choose to use the IESS for catastrophic coverage and continue on with their already established medical physicians. Our excellent family physician whom we have been patients of for a few months now charges $10 for an office visit (and spends as much time with us in that visit as it takes!). We've had x-rays, dental work, and eye care here. Every out-of-pocket expense is crazy-affordable-inexpensive! We always laugh when we leave an appointment - for joy! Back in the USA, we paid over $500 a month for our medical premiums and that was for a $10,000 deductible and catastrophic coverage ONLY! What's not to love about our medical care and caring physicians here??? 6 - HOME - Last and best of all - We're home! Coming home was a long long journey. To fly back from Oregon to Guayaquil is beyond a long journey. Well, this time Bo and I stopped in Florida to be with friends until our return. So, we flew from Tampa to Miami and were supposed to have only an hour layover, ready to arrive in Guayaquil at 7 pm - where our driver would be waiting to pick us up and drive us to our Cuenca home that evening. We should have been in Cuenca by midnight. Unfortunately, our plane had mechanical difficulties and they had to board us on another flight, landing us safely in Guayaquil at midnight. Our driver patiently waited for us (what a guy!!!) and drove us safely home by 4 am. Now, that was a LONG journey. 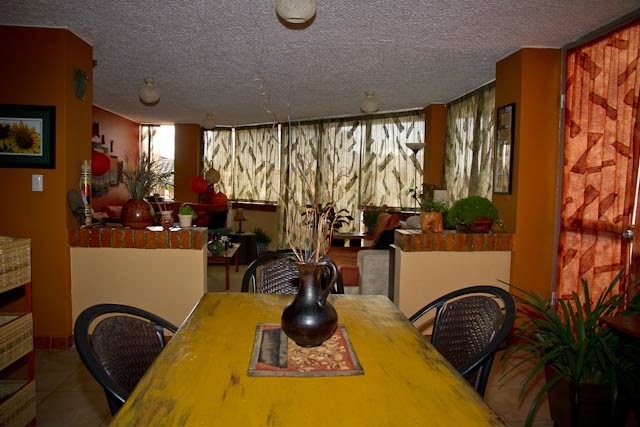 When we opened our apartment door and I walked in and saw my lovely place, I was SOOOOOOOO HAPPY! It was as though we had been gone for months. I have come to love our home and Cuenca more and more the longer we are here. As tired as we both were, Bo managed to haul our 8 suitcases up 3 flights of stairs. We fell into bed by 5:30 am, and slept most of the day. Yes, we had arrived home at last! It takes time to readjust to the altitude, food, and lifestyle upon returning, but we are now settled back into our daily routine, eating healthy, exercising, and enjoying our beautiful city. The worst is over - BURNING THE BRIDGE - and the best continues - LIVING IN ECUADOR! What I Missed About my Cuenca HOME! 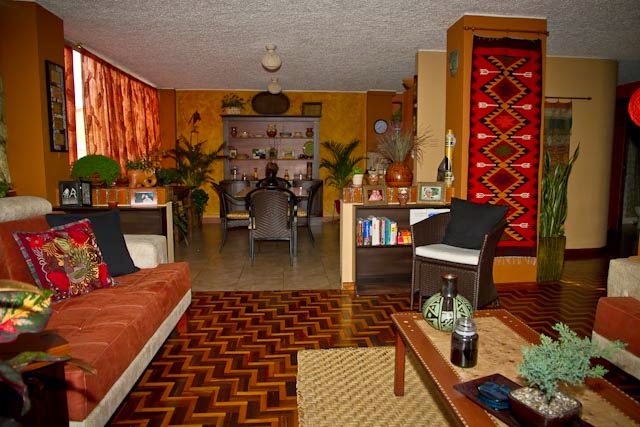 It was a joy to walk back into our cozy colorful apartment in Cuenca after being gone for several weeks. ......and I missed having special friends around our table for delicious dinners or weekly English classes. I missed opening my curtains every morning and seeing our beautiful Historic Cuenca view and letting the hustle bustle of city life sounds into our apartment. I missed taking care of my beautiful lush green plants (thank you to my three ñañas for taking care of my home). I missed hibernating in our TV room and watching a knuckle-gripping Thriller movie. ....and just relaxing and reading a good book. I especially missed spending time in my "girl cave" with my photography and other artsy pass times. 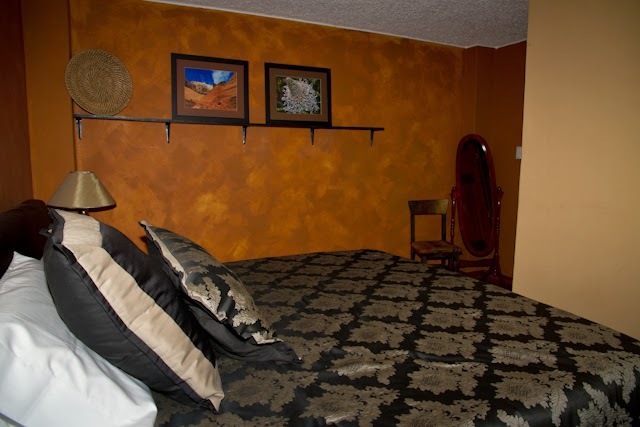 .......and at the end of a "City Life" day of retirement - I missed cozying up in our comfy KING bed and resting for the next day's adventure! Yes, it was a couple months back in the states of working and purging and letting go - but what a blessing of an apartment and home to come back to. 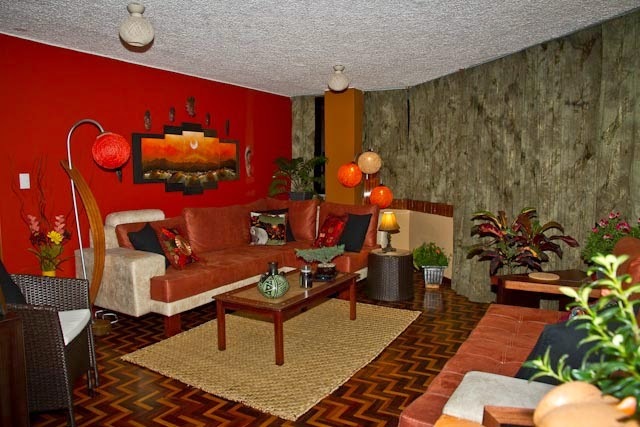 Not bad for $280 a month, hey?? ?